They've clearly read, learned, marked and inwardly digested the winning formula. 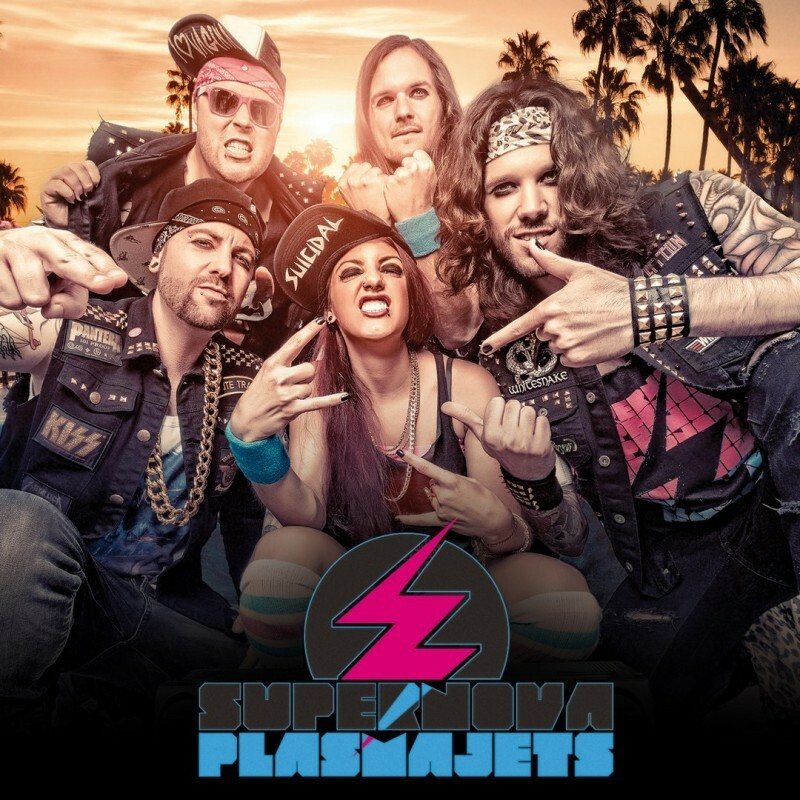 A band name that sums up the feeling that the tongue may be planted firmly in cheek and that there's going to be a strong element of fun and derring-do in the AORHeaven released Supernova Plasmajets debut album. 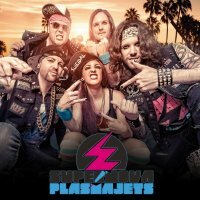 The cover image might portray the band as stereotypical wannabe, Sleaze Rocking, attitude pumping Rock stars, yet it also emphasizes their eighties Glam Rock influences which comes with their own late nineties Rock vibe encased in a Melodic Hard Rock coating. Promising "a slice of yesterday and a hint of tomorrow", their "energy of a new generation" comes courtesy of a solid wall of sound packed with melodies and hooks, topped off with plasma siren Jennifer Crush's overwrought vocal style, of which overexposure might test the patience. Musically, their sound is based around the twin guitar onslaught from the imaginatively named duo of Manni McFly and Randy Stardust, immediately making an impact with the slow building 'Leave Forever', keyboard washes to the fore before the curtain raising riff and wailing lead. There's almost a sense that you're going to hear about Tommy working on the docks... The mid-paced opening soon shifts into the Punky Thrash pace of what may be their theme tune 'Supernova Team' before the piano gets rolled out and the guitars briefly get put to one side. There's a big ballad coming in 'Hold You Close' but hold on for the big solo... the boxes are starting to get ticked off in a bizarre version of AOR bingo. They've clearly read, learned, marked and inwardly digested the winning formula. And so it goes – sprightly, shock Rock and Roll with a pinch of punchy impudence – brash and sassy is what they do best – goes side by side with the more Poppy side on 'Feel You Fear' and a dart into some Euro Rock aspects with 'Nothing's Gonna Stop Me Now'. It's all cordial though, enough not to scare anyone away and adds some variety to another album in a field which can be seen as a full to bursting battery farm. Sometimes the AOR model makes it hard to tell one from another. The Supernova Plasmajets at least are having a stab at flying their flag above the crowd.